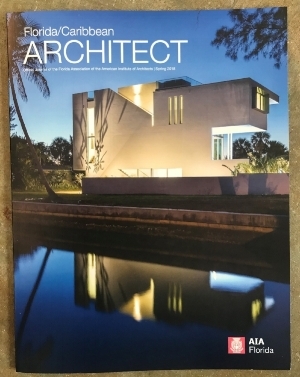 Our Anna Maria design-built residence graces the cover of Florida/Caribbean Architect, the quarterly magazine of the regional chapter of the American Institute of Architects Florida. It was distributed to every architecture office in Florida and in Puerto Rico. The sculptural side elevation showcases an exterior stair that leads to the roof terrace. A portion of the house cantilevers over a pool deck while a vertical window on the other end brings light to two story space.